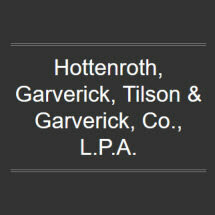 Hottenroth, Garverick, Tilson & Garverick, Co., L.P.A., is located in Galion and has been serving clients in north central Ohio for well over a half-century. Our general practice law firm offers skilled legal representation in a variety of practice areas including criminal defense, family law, estate planning and personal injury. We are often considered "hometown attorneys" by clients in north central Ohio. Our reputation is not just a matter of where we are located. Instead, it reflects our knowledge of and involvement in the communities we serve. Our clients are friends and neighbors, and we know most other lawyers, prosecutors and judges in this part of the state. When you hire Hottenroth, Garverick, Tilson & Garverick, Co., L.P.A., you can expect personal attention and service from attorneys who really care. We will listen attentively, explain all of your legal options and take a problem-solving approach to your legal matter and any related consequences. Because our lawyers collaborate with one another, you can be sure that you'll have the benefit of multiple legal opinions and you'll always have an attorney next to you in the courtroom. Whether you need help in criminal defense, DUI, family law, personal injury, estate planning or a variety of other legal matters, contact the hometown attorneys at Hottenroth, Garverick, Tilson & Garverick, Co., L.P.A.